see SPRING'S SEPT. 12 = Codices With Earliest Written Account of Jesus Confirmed Authentic & People Are “Fighting For Food” - Florence & China Is Preparing for Multiple U.S. Pearl Harbors? WE NEED TO STAND TOGETHER TO HELP THIS REPUBLIC! In 2007, Jennifer Solignac and David Elkington were shown images of a newly discovered set of books, of codices. They were surprising in one particular way: they were composed almost entirely of impure lead. Attempts to bring the lead codices into the public eye soon led to controversy and dismissals that they were fake – from people and institutions that had never even analyzed them. 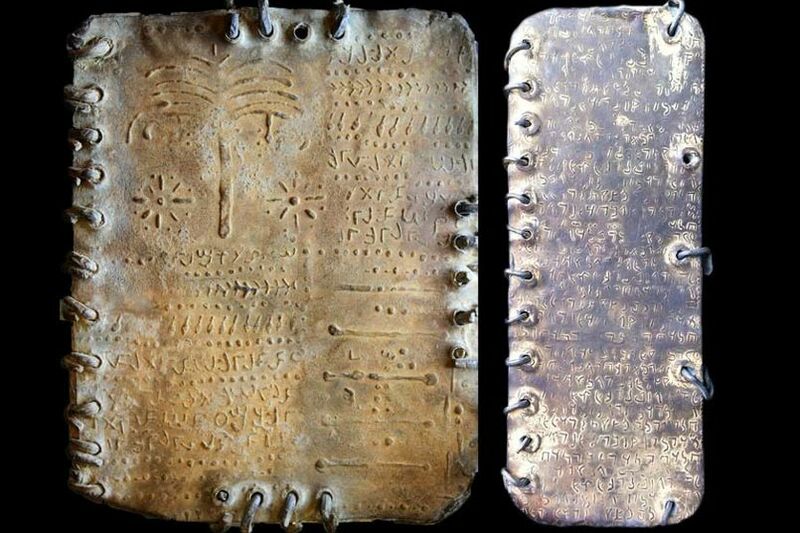 However, patient analysis and investigation have revealed the fact that the lead codices are both authentic and ancient. In August of 2018, the Pentagon released a report that was not covered in our corporate controlled media. 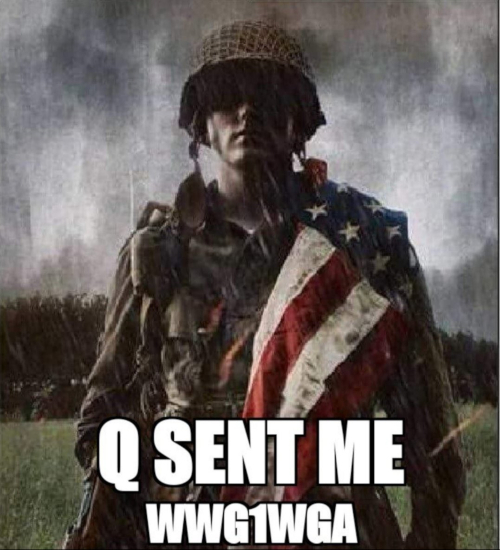 Subsequently, I have learned that the Pentagon held a closed door briefing on the topic of the Chinese preparing to unleash a series of Pearl Harbor type of attacks against the United States. The readers may be wondering where I obtained this information? It certainly wasn’t from the MSM in America. The reports surfaced in places like New Zealand and France. Before we get to the details of the report, it is important for all Americans to realize that we have been down this historical road before. 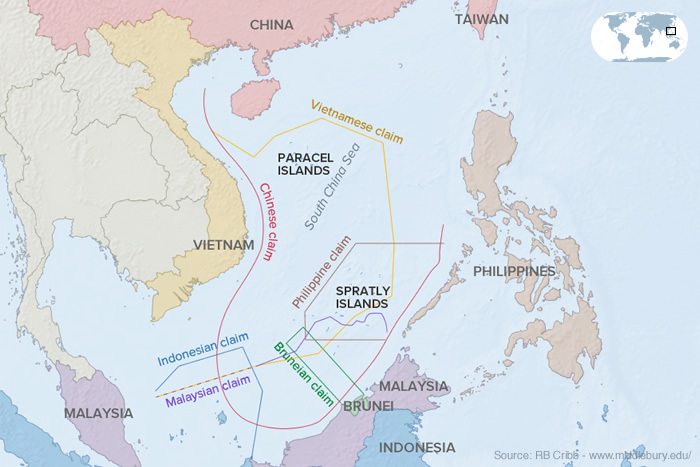 Please note the numerous and conflicting territorial claims regarding control of one of the world’s busiest shipping lanes, the South China Sea. Ever since President Trump introduced tariffs on Chinese products, the Chinese have greatly increased their naval presence in the South China Sea. Countries from Vietnam, to the Philippines, to Taiwan and Australia are fearful of China’s next move. China is in a similar position as to what Japan was in during the period from 1929-1941. They need natural resources to cover their expanding industrial base and the US is blocking them at every turn just like the US did in the 1930’s. And they are unable to feed their people. The US is exploiting this weakness in order to provoke World War III. Prior to WW II, the US created something called the 8 point plan (MCollum Memo). 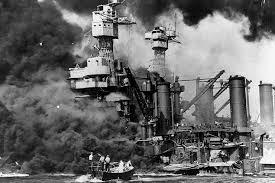 Eventually, this caused Japan to respond to the interference with its trade and attack Pearl Harbor. Is this what the Trump administration is doing? Is Trump still in charge of his administration. A decided shift occurred when Bolton joined the Trump administration. Rather than imposing a trade embargo with on China as FDR did with Japan, tariffs are being used to unseat the Chinese economy. Without going into laborious detail, President Trump has done exactly the same thing to modern-day China. The US has violated, with its ships every precept of Chinese claims in the South China Sea (go to the search engine on The Common Sense Show and put in “South China Sea” as a search term to see all of the articles I have written on this topic covering the past several months). For example, we have sent an aircraft carrier to Vietnam. We have moved massive amounts of shipping across the Pacific to Japan and South Korea and even Australia. The bulk of our carrier fleet and nuclear submarines are in Asia. And as stated, we are now looking at a desperate China because of the tariffs. The is the modern day version of the 8 Point Plan. Clear and convincing evidence is mounting that Chinese bombers are training for air strikes against the United State and/or their allied targets in the Pacific. This is exactly what we are witnessing in South Africa as previously reported on the CSS. China is siphoning off food from seized white South-African farms while splitting the mineral resources on these lands. And as previously documented the Chinese are covering their economic imperialism with their military as evidenced by their importation of surface-t0-air-missiles in Southern Africa. What does it say when I am forced to find out from New Zealand and French news sources about impending Pearl Harbor style attacks being planned by the Chinese? Where’s the American media? This information was delivered to Congress nearly a month ago and we are not hearing a word about this? More to the point, it is obvious that Trump’s economic attacks upon China is serving the same purpose as what FDR, through the 8 Point Plan, achieved in the pre-World War II era. This is our path into war. These events also help up to understand why China and Russia are engaged in the largest military war games since the end of the cold war. Unlike Japan, China will attack the mainland of the United States. This has been documented in no less than 6 articles published on the CSS in the past two weeks. I hope all of you are prepped and ready to be totally self-sufficient in the near future. “With the new track, you’re just exposing more shoreline to worse conditions,” said Evan Duffey, an AccuWeather meteorologist. "If Florence rides southward, as now forecast, it means its strongest side will rake the shore, threatening property from South Carolina to Virginia." 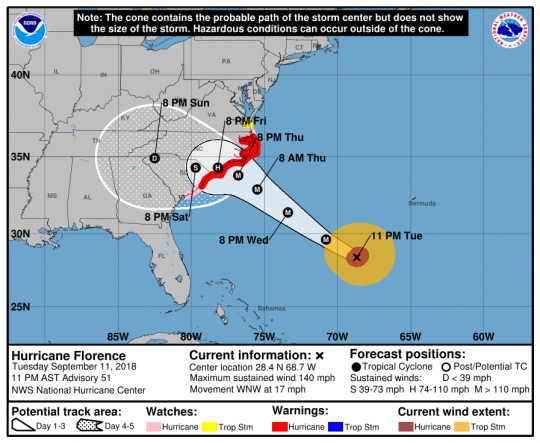 While Florence which is still 530 miles (855 kilometers) away from the coast, is expected to lose wind speed the closer it gets to land, it remains a formidable threat to the coastline from Georgetown, South Carolina, to Wilmington, North Carolina as peak winds could be between 100 and 120 miles per hour. While the storm will likely weaken further in the coming hours - and history is full of storms that lost power before striking land and are still counted as among the most infamous, Katrina, Ike and Sandy are just three - Bloomberg notes that they all stand as proof that ranking on the Saffir-Simpson windscale alone isn’t a measure of power. According CBS, the coastal surge from Florence could leave the eastern tip of North Carolina under more than 9 feet of water in spots, projections showed. "This storm is going to knock out power days into weeks. It’s going to destroy infrastructure. It’s going to destroy homes,” said Jeff Byard, an official at the Federal Emergency Management Agency. •The effects of the hurricane will be felt hundreds of miles away, including in Virginia, Tennessee, Kentucky, and Georgia. • By Wednesday morning, the storm was 575 miles southeast of Cape Fear, North Carolina. It had maximum sustained winds of 130 mph. • The NHC issued a hurricane warning from South Santee River, South Carolina, to Duck, North Carolina. • Florence's weakening is expected Thursday, but it's still forecast to be "an extremely dangerous major hurricane." • Life-threatening storm surges -- up to 13 feet -- are expected along the coasts. Up to 35 inches of rain could dump on the region through early next week over parts of the Carolinas and Mid-Atlantic states. Florence’s projected path includes half a dozen nuclear power plants, pits holding coal-ash and other industrial waste, and numerous hog farms that store animal waste in huge lagoons. Duke Energy spokesman Ryan Mosier said operators would begin shutting down nuclear plants at least two hours before hurricane-force winds arrive. "Florence will approach the Carolina coast Thursday night into Friday with winds in excess of 100mph along with flooding rains. This system will approach the Brunswick Nuclear Plant as well as the Duke-Sutton Steam Plant," said Ed Vallee, a meteorologist at Vallee Wx Consulting. "Dangerous wind gusts and flooding will be the largest threats to these operations with inland plants being susceptible to inland flooding," said Vallee. Bloomberg notes that Florence may cause upwards of $15 billion to $20 billion in covered losses from wind and coastal storm-surge, if the past is any guide, according to catastrophe modeler Risk Management Solutions (RMS). Covered losses are based on benchmarking two similar hurricanes from decades past -- Hazel in 1954 and Hugo in 1989, and convert their damage into present-day dollars, according to Tom Sabbatelli, an event response manager at RMS. However, the figures do not include the potential cost of inland flooding, which Vallee believes could be the real danger at play. "People living well inland should prepare to lose power and endure flooding and other hazards," Graham warned. "Uncertainty. HurricaneFlorence is now forecast to slow down. That could bring prolonged winds and rain along the coast. Over a foot of storm surge and potentially 40 inches of rain depending on where the storm tracks. Details coming up," tweeted Janice Dean, Senior Meteorologist at Fox News Channel. European models are showing the hurricane could stall right off Wilmington, North Carolina on Friday as a major hurricane, said Ryan Maue, Meteorologist @weatherdotus. "LATEST track on Hurricane Florence has a decided shift south. Will stall is it approaches the NC coast Friday and then drift slowly into SC as it weakens," said Cindy Fitzgibbon, Meteorologist at WCVB. North Carolina’s governor Roy Cooper issued what he called a first-of-its-kind mandatory evacuation order for all of North Carolina’s fragile barrier islands. Typically, local governments in the state make the call on evacuations. Subject: Re: see SPRING'S SEPT. 12 = Codices With Earliest Written Account of Jesus Confirmed Authentic & People Are “Fighting For Food” - Florence & China Is Preparing for Multiple U.S. Pearl Harbors?